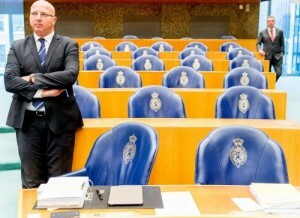 THE HAGUE - The PVV faction presented a bill initiative to allow criminal Antilleans to be expelled from the Netherlands. The debate in the Second Chamber of the Dutch Parliament got out of hand. All hell broke loose. MPs leaven the hall demonstratively and an angry President of Parliament calling the scolding MPs to order. SP Member of Parliament Ronald van Raak spoke of "a sad debate". He asked PVV spokesman Alexander Kops why he would remain in the room if the PVV did not want support from other parties for the proposal. Kops had indeed called "What are you doing here?" when parties such as the SP and the CDA asked critical questions about the initiative law sponsored by PVV MPs Sietse Fritsma and Machiel de Graaf. The PVV proposal means that people from Aruba, Curaçao or Sint Maarten can be deported if they commit a crime in the Netherlands. According to the PVV, the law is necessary because Antilleans are overrepresented in crime. The Council of State critically judged the proposal because it would treat citizens within the Kingdom unequally and called it "not proportional". The PVV bill also found little support from the Chamber. CDA Member of Parliament Madeleine van Toorenburg, who said she recognized the problem of criminal Antillean youngsters, thinks that the PVV uses "the blunt ax". VVD member André Bosman called the proposal "incomplete" and in violation of the Statute for the Kingdom. Only the SGP saw opportunities to support the PVV law, although according to Member of Parliament Roelof Bisschop "a lot still needs to be changed".